ALBUQUERQUE, N.M. — Spent nuclear fuel needs to be safely transported from the power plants where it is generated to interim storage locations and eventually to a permanent geologic disposal site. Late last year, Sandia researchers completed an eight-month, 14,500-mile triathlon-like test to gather data on the bumps and jolts spent nuclear fuel experiences during transportation. The data from this test could be used to demonstrate the safe transportation of spent nuclear fuel. Nuclear power supplies almost 20 percent of U.S. electricity and is the leading carbon-neutral power source. However, it produces between 2,200 and 2,600 tons of spent fuel in the U.S. each year. Fuel rods become brittle and highly radioactive while powering the nuclear reactor, making safe transportation important. "All of our preliminary data suggests that the likelihood of a fuel rod breaking during routine handing and transportation is low. This test is more realistic than past tests and could result in a more reliable quantification of the transportation risks," said Sylvia Saltzstein, manager of the transportation projects. Sandia collaborated on the triathlon with Equipos Nucleares S.A. (ENSA), the Spanish cask designer and manufacturer, and Empresa Nacional de Residuos Radiactivos S.A. (ENRESA), the corporation responsible for the management of nuclear waste in Spain. The Korea Radioactive Waste Agency (KORAD), Korea Atomic Energy Research Institute (KAERI), and Pacific Northwest and Argonne national laboratories also took part in the triathlon. A grid of almost 300 rods makes up a fuel assembly, and the cask used in the test can hold 32 assemblies in a specially designed basket. The mock fuel rods within the three assemblies were outfitted with tiny accelerometers and strain gauges before they went into the cask. The cask and basket were similarly equipped. The accelerometers and strain gauges measured each bump, rattle and jolt the mock fuel experienced during the trip, yielding data that can be used to quantify the safety margins of transporting spent nuclear fuel. Though Sandia has thoroughly tested the robustness of nuclear waste casks during decades of simulated catastrophic transportation accidents, another challenge is the stress from everyday transportation on the fuel rods inside the cask. Saltzstein and her colleagues hope that repeated jostling won't lead to a fuel rod snapping, like bending a soda can tab one too many times. 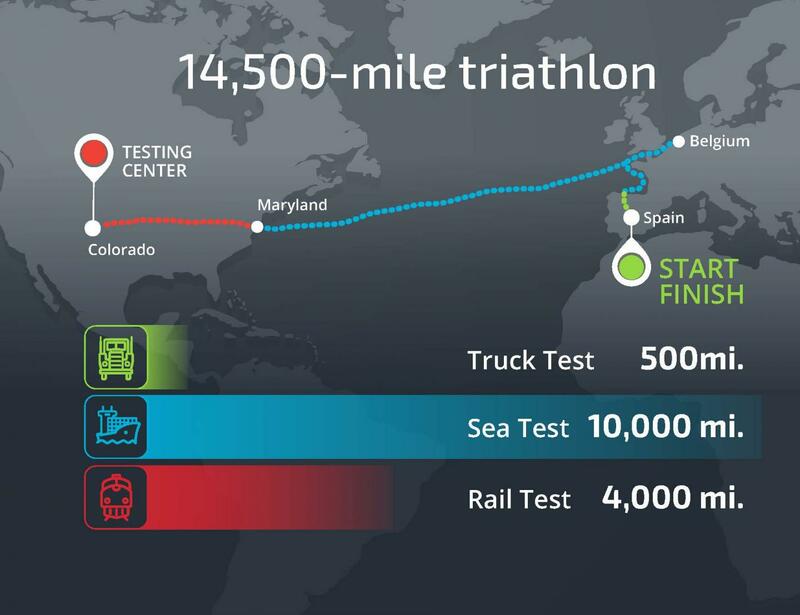 The triathlon is actually Sandia's fourth test to measure routine transportation strains. The first used a large shaker table to test Sandia's sensor-studded mock fuel assembly, with lead rope in zirconium alloy tubes to mimic the weight of uranium pellets. A shaker table is just that, a table that vibrates up and down in a controlled manner. The researchers programmed the table to reproduce the shocks and vibrations from traveling by truck and measured the strain experienced by the fuel rods. Although a reasonable initial test, the table only went up and down, so more testing was needed. The second test placed the same assembly on a truck trailer loaded with 50,000 pounds of concrete, the same as a transportation cask, and took it on a 38-mile trip on highways, city streets and dirt roads. This test showed similar, very low, levels of strain on the mock fuel. However, since spent nuclear fuel mostly will travel by train, the third test looked at the shocks and vibrations experienced riding the rails. Sandia researchers took shock and vibration data provided by the Association of American Railroads to set up a shaker table that could move in six directions instead of just up and down, simulating the strain and acceleration of train travel. They also replaced the lead rope in some of the rods with lead and molybdenum pellets for a better approximation of spent fuel. This test agreed with two earlier tests: The stresses from normal transportation are about 100 times lower than the stresses known to damage nuclear fuel rods. The three tests gave Sandia researchers confidence, but they needed a yet more realistic test. For the triathlon, they moved an actual spent fuel cask provided by a Spanish partner, but very similar to those used in the U.S., from one mode of transportation to another to obtain data closer to real world conditions. The triathlon started in northern Spain, where the cask traveled by heavy-haul truck for about 250 miles through main roads and highways. After a layover to download data from the sensors, the cask was transferred to a barge, which skirted along the coast of France to Belgium, sailing more than 1,000 miles over four days. After a layover in Belgium, the cask was transferred to a cargo ship. Then the ship crossed the Atlantic to Baltimore — almost 4,000 miles — through sometimes rough seas. This took two weeks. In Baltimore, the cask was transferred to a dedicated flatbed train car and traveled west about 2,000 miles through 12 states, which took seven days. Then, in partnership with the Association of American Railroads, the cask and fuel assemblies were tested at the Transportation Technology Center Inc. facility near Pueblo, Colorado. The center has almost 50 miles of test track, permitting such controlled scenarios as joining two rail cars together or rumbling over a track crossing. After these trials, the cask with its sensors reversed course and returned to Spain. In addition to the logistical challenges, the biggest technical challenge was building a data acquisition system that could collect all the shock and vibration data robustly and unsupervised, said Paul McConnell, project manager for the tests. A Sandia contractor, Bill Uncapher, designed the system and Sandia technologists, Carissa Grey and Wes Chilton, built the system. The rail cask test generated about 8 terabytes of shock and vibration data. Saltzstein expects the full analysis will take nearly a year. The data from the test also will be used to validate computer models of the stresses experienced by spent fuel during normal transportation. "Preliminary results show very low shock and vibration levels, which we will compare to the mechanical properties of fuel that's come out of a nuclear power reactor," said McConnell. "Ultimately, we want to understand if the fuel can withstand the accumulation of shocks and vibrations during the journey that could potentially cause a fuel rod to break." The test was partially funded by the Department of Energy Office of Nuclear Energy's Spent Fuel and Waste Science and Technology program.